I’m not happy with this categorisation, and want to talk about the problems I have with it. This post is lots of speculation on my part – I haven’t found an authority that deals with these problems. Kelsen distinguishes between laws as normative statements, and rules of law, i.e. statements about normative statements. These categories are created so that you can tell the difference between the work of a judge and the work of a legal academic: one of them makes the law, the other merely suggests rules of law. A Criminal Law textbook does not have the same kind of meaning as the Crimes Act. This seems like a reasonable distinction to make, so far. However, Kelsen then claims that all imputational statements of the form ‘If X is, then Y should be’ are in fact rules of law, not norms. This seems strange to me because the two statements “Thieves should be punished” and “If someone is a thief, then they should be punished” seem equivalent, but under Kelsen’s separation, one is a law, while the other is a rule of law. Why can’t the Crimes Act contain a law that says “If a person steals, then they should be imprisoned?” Aren’t statements like these just a particular kind of normative statement? One solution would just be to reject Kelsen’s second claim, and just say that a statement “If X is, then Y ought to be” can be a norm or a rule of law, depending on the context in which it was created. But Kelsen was pretty smart, and we’ll need some strong arguments to justify disagreeing with him. I want to keep thinking about this. The motivating difference between law and rules of law is one of authority. A legal scholar has no authority to say what the law is, and so even correct statements made by a scholar are not ‘law’. Science does not seem to reflect this. Everyone has equal authority within science, and anyone can propose scientific laws. In fact, if there is a difference in authority, it is between scientists, who describe the laws, and nature, who makes the laws. This suggests that the equivalent of ‘Rules of Law’ should in fact be the set of Descriptive Statements, not something on top of that called ‘Rules of Science.’ This is my hypothesis for how I think this must work – I’m not backing this up with an authority. This also makes sense in that conditional statements, e.g. “If you heat this metal then it will expand” seem very similar to general descriptive statements “Heating metals expand.” I think it would be very weird to separate these kinds of statements. So what are Rules of Science then? We want them to be statements about descriptive statements. I think they are things like the description and discussion of the formal scientific method, and discussions on ‘what is a law?’ In that case, all the laws themselves definitely exist within the Descriptive Statements sphere, and not the Rules of Science sphere. I will follow up on this if I learn anything or think of a good idea. Solution: After reading up on Kelsen a bit more, I think I’ve got the answer as to how to tell the difference between a Law and a Rule of Law. Let’s say a Criminal Code has the law “You ought not to kill,” and then a legal scholar writes in their article “You ought not to kill.” Clearly, the legal scholar’s instruction does not have the normative force of the law. However, the scholar’s claim is not merely a description of the form ‘The law says “You ought not to kill.”‘ It is something in between, what Kelsen called ‘a descriptive ought,’ i.e. something that is both descriptive and normative. H.L.A Hart creates the following analogy: There are a bunch of English prisoners in a French prisoner. The Warden shouts something in French, and a French-English translator calls out (in English), “Everybody should go to their cells!” The translator has no authority, and so they are not the one issuing the normative statement. But they are not directly repeating the Warden’s words either – their use of should is a descriptive ought. Hart develops this analogy and give the translator more leeway. Say the Warden is afraid of fire, and constantly gives orders like “Pick up that straw!” “Pick up those sheets!” The translator, to save time, simply says “Pick up all flammable objects.” In this way, the translator is clarifying the law without adding new content. My own example would be if the Warden points in a direction and says “Put that away!” and the translator looks over there and translates “Put that broom away.” This is not what the Warden literally said, but it makes things clearer. So how does this analogy apply? For a start, we can say that every legal norm has a corresponding rule of law describing that norm. This is the example from before, the difference between a statute and a textbook saying “Do not kill.” But a law says what is says; if you rephrase “You ought not to kill” as “Killing brings a sanction” then the rephrasing is your interpretation. It is no longer a law, and is instead a rule of law. 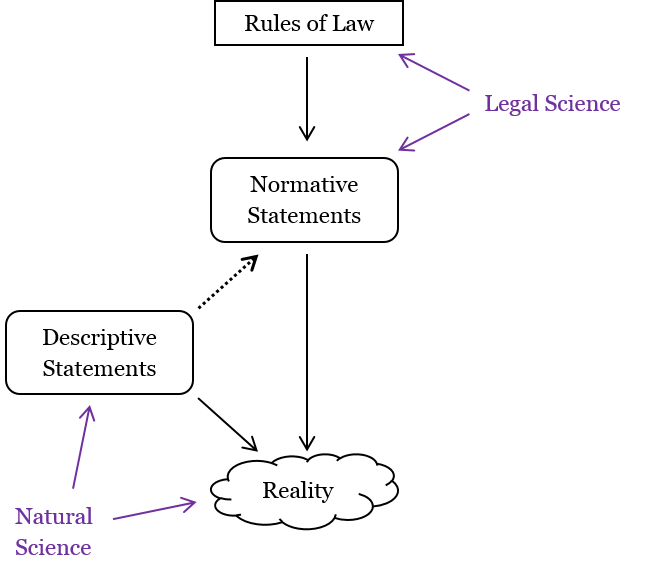 A legal scientist creates such rules of law so that the law may be better understood. For example, say we have a law that says “You ought not to kill (max penalty 25 years jail).” A legal scientist wants to express this law in Kelsen’s format, where delicts are the conditions for sanctions, and so they rephrase the law as “A person who kills receives a sanction of up to 25 years imprisonment.” As with the Warden/Translator, this is not what the law literally said, but it makes things clearer from the perspective of legal science. We hear about how all dependent norms can be phrased as conditions in a rule of law, i.e. “If a person is found to commit a delict by an organ authorised to do so, and the relevant laws are in accordance with the Constitution, etc. etc. then there should be a sanction.” This is a rule of law, because no legal norm actually says this – it must be inferred through a bunch of separate laws (e.g. the Constitution and the Criminal Code). That is the reason why imputational statements are not legal norms. If a legal scientist were granted the legal power to make all the rules, she could choose to write the laws in cumbersome, imputational form, and then they would be legal norms. The only reason why imputational statements are considered rules of law is because they are posited by legal scientists rather than legal organs. This all supports the argument that the “Rules of Law” set is closely linked to the “Descriptive Statements” set, rather than the “Rules of Science” set.